This is by far the fastest way to connect and manage your MySQL server. This is the preferred method if you are not concerned about your MySQL traffic being spoofed. However, this requires direct access to your MySQL server. To connect using this method, just select MySQL tab in the connection window. Fill in all the details about the server you want to connect i.e. host address, user name, password and the port number. If you don't give any details SQLyog will try to connect to localhost with the default user as root and port number 3306. You must connect to a MySQL Server before you can perform any activities with the software. SQLyog's connection manager lets you to save unlimited Connection Details. After you have connected to an instance of MySQL, you can make additional connections by selecting the New Connection option from the File menu. Saved Connections Select the connection name from the list. To rename a saved connection, click on the Rename button and edit the connection name and click save option to save the changed connection name. Other details can also be changed by selecting the particular connection, changing the necessary values and then by clicking on save to save those values. 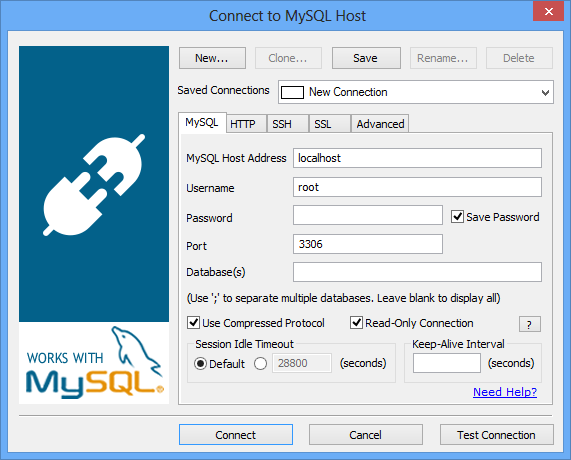 MySQL Host Address Specify a host name where the database is situated or the IP address of the server. User Name Specify a user name for connecting to the database server. Note: This is MySQL username. Not your FTP or web server username. Save Password Check this option if you want SQLyog to save your MySQL password and to stop asking you to enter it in the future. Port Define a TCP/IP port for connecting to the database server. Databases Database name. You may enter several database names separated by semicolon (like db1;db2). If you do not enter the database name, all the database names would be listed, to select from. Compressed Protocol: Do not take for granted that use of compressed protocol will always increase performance. Use of compressed protocol will decrease the amount of data to be transferred over the network, but it will result in additional load on both the server and the client (compressing and uncompressing). You should preferably not use the option when connecting to MySQL on local machine, on local network or over a very fast Internet connection. With slower network however it may improve the overall performance. It is impossible to be more specific as most Internet connections have asymmetric properties that differ across Internet providers and telecom companies. Session Idle Timeout: The option to define timeout for the session (different from the global setting) is possible with MySQL servers from 5.0 and up. However, most users will need not to care about it - not even if server timeout setting is low. SQLyog will reconnect if connection was lost since last query was run. Most often user does not even notice. However, we have reports of situations where the network takes very long time to process such reconnect request. In this situation setting the timeout from the client will prevent the situation. Also SSH-users connecting to SSH servers/daemons that are slow to establish connection and where MySQL has a low timeout setting can use this option with advantage. Keep-Alive Interval: In some cases, setting a high session idle timeout does not prevent disconnection. This option sets a time interval at which mysql_ping() will be executed. This should only be used if setting a high session timeout does not prevent disconnection. Also the interval specified should be the highest possible interval which still prevents disconnection. When a Keep-Alive Interval is specified, there could be a small lag if a query is executed at the exact same time as the ping. This is because the ping has to finish executing before the query can be executed. If you don't give correct details, SQLyog will not be able to establish the connection. And if some user details are entered that have not been created in the MySQL user table MySQL will refuse the connection. If you install your own MySQL server there will be a 'root' user (with no password) available from the start. If you use a server hosted by an ISP (Internet Service Provider) you should have your user details from there.